Fakes moutzentra (pronounced faa-KHESS) is a lentil pilaf dish we make in Cyprus with “tiganissi” (caramelized onions). The combination of lentils with rice makes it a high protein, well balanced healthy and nutritious dish. 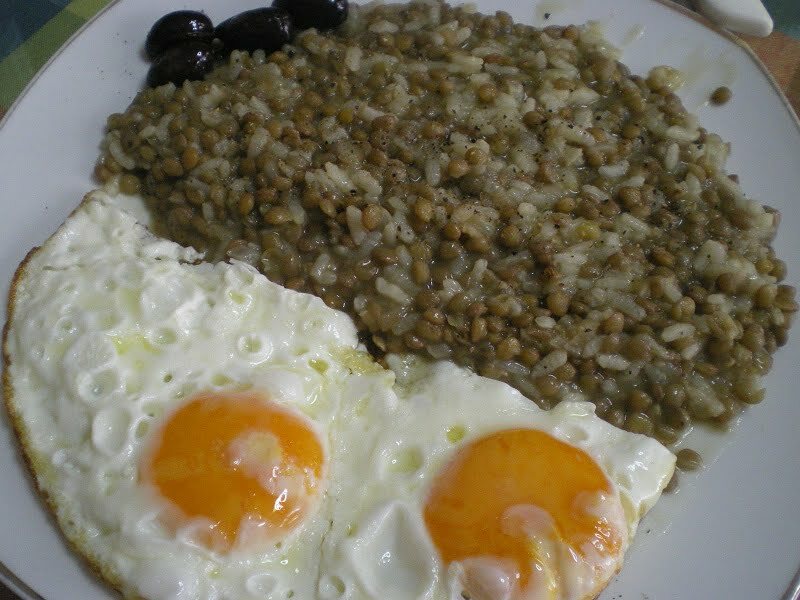 In Greece they make a similar recipe in the Aegean islands which is called Fakoryzo, meaning lentils and rice. Until recently, I used to think that this is a Cypriot recipe but finding recipes all over the world I found out that a lentil and rice dish is referred to in the Middle East as mujaddara or mejadra and I now realize that this Cypriot dish may have some middle eastern influence. Or is it the other way round? A couple of months ago, I got an email from a Cypriot reader of my blog, who lives in Adelaide, Australia, who has a background in linguistics and informed me regarding the etymology of the word moudjentra / moujentra, in Cypriot μουτζέντρα. The word is connected with a recipe with lentils which she may have probably read either in my post for Fakes Moudjentra or in my Cookbook Mint, Cinnamon & Blossom Water, Flavours of Cyprus, Kopiaste!. Read the interpretation in my post for Brown Lentils with Smoked Eggplant. I remember when my mother used to make moutzentra, she would fry lots of onions until caramelized and mix them in. However, I also remember how we used to hate the onions when we were young and since we would not eat the lentils, she would also fry some eggs for us. When my children were younger, they didn’t like them either, so in order that my children would start eating them, I would not let the onion brown completely so that it would not be visible in the plate. We also make the same dish substituting rice with any kind of small pasta in it, especially orzo. In Cyprus we use the brown lentils which do not need to be previously soaked in water. These lentils cook very easily, however depending on where you live, you may have to soak the lentils overnight. Fakes moutzentra is a lentil recipe we make in Cyprus and is a high protein, balanced healthy food, especially with the combination of rice. Clean the lentils as sometimes small stones may be found in the package and then wash and drain them. Boil in a pot with enough water to cover them, together with bay leaf, for ten minutes. Drain them, add fresh water (just to cover them, about 2 cups), bay leaf and vegetable bouillon and bring to a boil again. Lower heat and cook for 15 minutes or until soft. Add the rice, salt and pepper, lower heat and simmer for 15 minutes, mixing every now and then. Meantime, in a 23 cm (9”) non-stick frying pan heat the olive oil and sauté the onions until they caramelize and start to turn to brown. When the rice is cooked, add the caramelized onions with the oil, stir and remove from the heat. Allow to cool for ten minutes and serve while warm. The recipe is included in my cookbook Mint, Cinnamon & Blossom Water, Flavours of Cyprus, Kopiaste as well as in Volume 1 of my e-cookbook.